Orlando would not be my preferred destination for the Fourth of July. 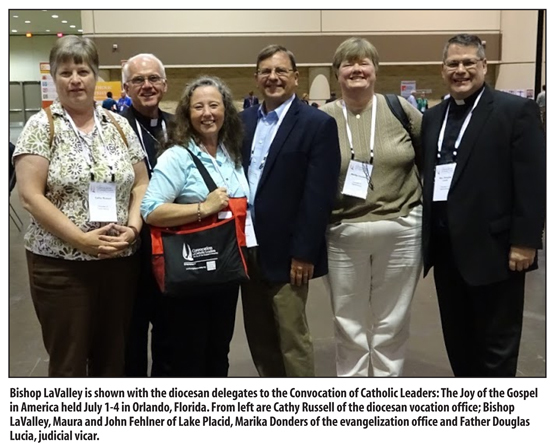 Nevertheless, Marika Donders, Cathy Russell, Maura and John Fehlner and Father Doug Lucia joined me and 3500 other Catholics from across the country at the Convocation of Catholic Leaders: The Joy of the Gospel in America from July 1-4 down in the Sunshine State. Such a gathering had never occurred before. I’m glad I went. The days were truly grace-filled. We heard uplifting, challenging presentations and homilies. We participated in beautiful Masses, a powerful Evening of Reflection, and a moving Rosary prayer experience. We listened to inspiring witness talks and enjoyed an evening of powerful witness and praise accompanied with great music. We attended various workshop sessions which became opportunities to learn, share best practices and affirm our own diocesan efforts in evangelization. Among the many topics were: The Church in the Current Political and Cultural Climate; The State of the Family; The State of Catholic Education; International Solidarity; the “Throwaway Culture;” Ministry with Inactive and Disconnected Catholics; Discernment of Vocations and Charisms; Ministry to the Incarcerated; and Reaching the Margins in Rural America. Participants came from various dioceses, ministries and cultural families. The Bishops of the United States had planned this convocation years ago, envisioning it as an opportunity for the Catholic faithful to come together in the Lord, to affirm our unity in the joy of the Gospel and to seek a renewed outpouring of the Holy Spirit upon our Church. We looked at the landscape and “mission field” in which Catholics in the United States live today. We were inspired and motivated to renew our commitment to the Gospel as missionary disciples. In our final session on the last day, our diocesan participants had an opportunity to assess what we heard in our time together and discuss how this can impact our ministry in the North Country. We were particularly interested in how we might apply what we learned to our Diocesan Priorities: Creating a Culture of Vocation, Strengthening Faith Formation in Family Life and Building Parishes as Living Stones. The Holy Father is challenging you and me to creatively address our Diocesan Priorities and make a real difference in our families, parishes, the North Country, even our world, as disciples in mission. In the process, more and more, we’ll come to know real joy, even in the midst of so much uncertainty in our world today. The Fourth of July in Orlando—the place to be this year!